599 cc / 36.6 cub in. NUMBER ONE BIG Boss Yamaha looked long and hard at the best-selling CBR600 and thought "I want some of that". He called Number Two into his office and said: "I don't care about £10,000 racer-rep perfection or race track glory. I want huge amounts of cash. Build me a bike that sells like the CBR." Number Two Big Boss trotted off had a quick look at the venerable FZR and threw most of it YZF750, going like Hondas all away. Two years later the 1994 conquering CBR and feeling as FZR600R appears, looking like comfy as a ZZ-R. Yamaha's king sportster the YZF750, going like Honda's all conquering CBR and feeling as comfy as a ZZ-R. If the FZR is priced where Yamaha says it will be — no more than the CBR - then Number Two could be on for promotion and Number One might retire early because the new FZR600R feels and looks good enough to make Yamaha one large pile of money. To achieve this, Yamaha has resorted to cunning rather than technical breakthrough. 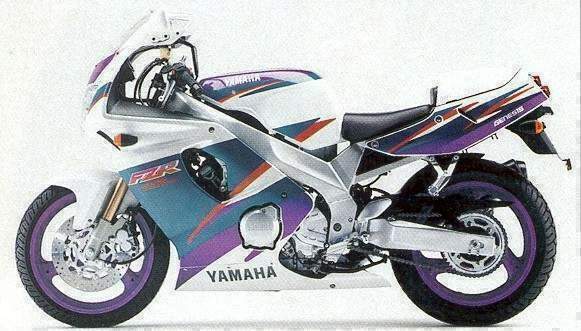 Making the FZR much faster than Kawasaki's ZZ-R600, giving it far better suspension than Honda's CBR, or making it 80lb lighter than Suzuki's RF600 were not options. All were too expensive. Building a true YZF600 was not the plan. 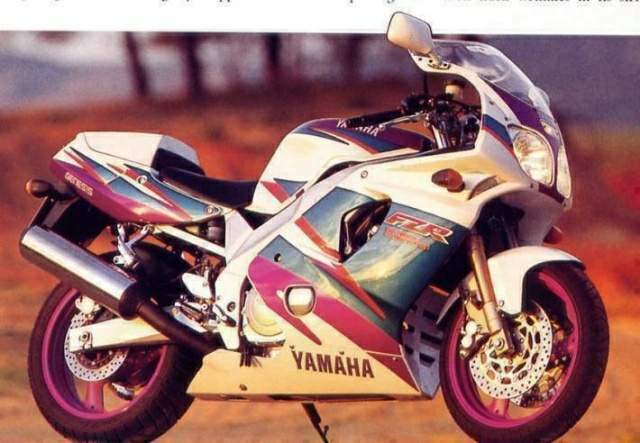 Instead, Yamaha opted to work on the engine and chassis until it could compete with the opposition in terms of speed, corners and practicality, then give the FZR an edge which wouldn't bump the price up. The edge is that from ten yards the new FZR looks 10mph faster than the ZZ-R, four seconds a lap quicker than the CBR and more expensive than all of them. It looks like the YZF750 - BIKE's Sports Bike of the Year and every boy racer's dreamboat. In fact, much of the bodywork is YZF750. The fuel tank, rear seat, side fairings, tail light, instruments, mirrors (hooray, the diabolical old round ones are gone), front footrest brackets and headlights are identical to the YZF's. Yamaha has given the FZR600R instant race credibility and saved itself designing lots of fiddly new bits in one crafty swoop. With the Racer-Replica Poseurs safely on their way to see the bank manager for a loan, Yamaha moved on to winning over the powerful I Need It To Be Practical lobby. First job was to hide the conservative riding position behind or glory plastic. The bars are higher than the old FZR and moved closer to the rider, but footpeg and saddle positions are left alone because they were felt to be on the roomy side to start with. On the road the riding position felt relaxed, comfortable and not particularly sporty. On the track it felt like the clip-on bars were two inches too high. Bit like the CBR really. Noticeable both on and off track was the decent amount of protection given by the steeper, wider screen. A racing tuck isn't needed to stay out of the wind, and when sitting normally only the top half of the rider's helmet gets abuse. Wind noise is reasonable too, with only a hint of the booming turbulence that turns many a fine bike into a long distance splitting headache. Yamaha states in its Eurospeak publicity guff that the FZR600R is the "Best Middle Sport With Racer Looks". To attain the Best Middle Sport part of this linguistically challenged accolade the FZP must go like the clappers because the competition does. It is instantly apparent that much fiddling has been done to the engine. The old FZR endeared riders with its robust midrange but left them wanting more as soon as the tacho needle edged towards 10,000rpm. Where CBRs, RFs and ZZ-Rs surged, the FZR splurged. Not any more. Bigger bores, bigger carbs and bigger intakes let the FZR blast straight into the 98.6bhp club to join the other three hot 600s who all now claim a power output of 100PS (German for 98.6bhp). The redline climbs 1500rpm to 13,000 and with it comes a dollop of top-end power that feels just as potent as the muscular ZZ-R600's. Down the long back straight at the launch race track, the FZR was hitting an indicated 140mph where full power EXUPs were doing 150. Not a bad effort considering the old FZR would only indicate 140mph after two miles of runway and tail wind. On the roads the FZR proved this new found speed wasn't just a case of coming out of the preceding corner faster, by streaking away down straights and taking ages to catch even when the pursuer had an extra 45bhp up its exhaust pipe. The new FZR600R is quick. But the gruff midrange is still there. From 4000 to 9000rpm the traditionally hoarse FZR inlet roar accompanies a build up of power that feels just as strong as the old model's. It's smoother and lacks the charismatic harshness of the oldie, but hasn't the synthetic whirr of its rivals — there's a bit of the brash old FZR character left in there. On the track the lack of an EXUP exhaust valve was as noticeable as the lack of bar mounted choke. But in real life it's hard to fathom why the choke lever has to be behind the rider's left knee when the reserve tap is a neat switch, and easy to imagine how much stronger the midrange would have been with EXUP. Not much stronger according to Yamaha, and certainly not enough to warrant the extra £600 EXUP would add to the FZR's price. New brakes would bump up the price too and as the old FZR had stoppers to match its attitude — harsh, cheap but ruthlessly effective — Yamaha decided to use the same calipers and discs. Yet the brakes of the new FZR have lost that exciting edge, and felt slightly woolly on both track and road. The new bike is only 3kg heavier than the old one so the change has to be down to Yamaha 'improving' the master cylinder and brake lines. Somehow, this improvement has removed the reassuringly aggressive initial bite of the old FZR's stoppers. It's never worrying because the power is there, and once the rider's used to them, the brakes work acceptably well. On the smooth test circuit any chassis compromises introduced by budgets did not make themselves obvious. The forks were on the soft side and dived hard under braking, but never juddered, pattered or felt they were losing it. The back-end took track wrinkles in its stride while banked over, and 96.8bhp failed to upset it. It was the geometry that raised eyebrows. The engine now hangs 10 degrees more upright than last year's so the wheelbase could be cut by 10mm. This brings it down to a frisky 1415mm. Countering this is a 3mm increase in trail and wider tyres. The combination of that lot leads to a much milder FZR. Rolling the FZR into the test circuit's slower corners was a joyously simple, controlled process, leaving the rider plenty of concentration to monitor how close the front tyre was to going AWOL. Gone is the old FZR's 250-ish snappy feeling; the new one felt more like quick 750 than a 250. The new geometry didn't work quite as pleasingly coming out of faster bends, where the FZR had to be persuaded to hold a tight line by peg pressure and hauling it over with the outside leg. As faster riders got on the throttle harder and earlier the effect became more and more pronounced. 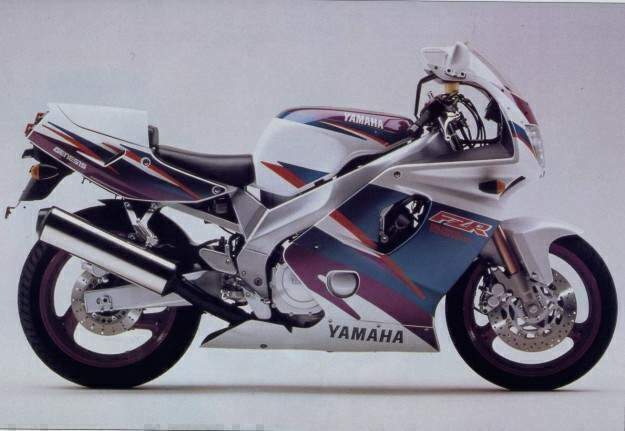 Yamaha was wise to launch the FZR on both track and road, because although raising the rear and dropping the front cured the understeer problem at the track, it was indiscernible during a day's road riding. Significantly, the FZR could be cruised through scenery, hustled through twisties or blasted down dual carriageways with equal ease and competence and no sign of any problems. The new FZR is a highly capable road bike. It is also fun, not just for brief moments, but for hours on end. On track and road the FZR always had enough power to raise grins, and enough comfort to keep them there. In the war that is the 600 market, the FZR has turned from an ageing battle axe into a rather fetching sub machine gun. Big Boss Number Two must be proud. The opposition should be worried. ALL NEW. The aim was to give the new FZR a belting top-end so it could keep up with CBRs, keep the old FZR's gutsy midrange and increase reliability. EXUP exhaust valve not allowed because it costs too much. To get the top-end power, the new engine had to be revvier, so bore was increased by 3mm to 62mm with stroke dropping 4.2mm to 49.6mm. With that midrange in mind Yamaha didn't go as far down the over-square route as Honda, Kawasaki and Suzuki - their 600s, have bores around 65mm. More power comes from the 34mm Keihin carbs, 2mm larger than the old Mikunis. Maximum power is boosted to a claimed 98.6bhp (identical to Honda, Suzuki and Kawasaki's claims). Top-end mission accomplished. Better throttle response comes via lighter valves, pistons and crankshaft and straighter inlets. It was always suspected that the old FZR was having its midrange kicked to death by noise regulations which each year meant another set of baffles got welded into the four-into-one exhaust. The new four-into-two-into-one exhaust is designed to comply with the regulations without crippling midrange. No surprises so far. But wait. Yamaha has got radical with its cylinder bores. Instead the usual cast sleeves, the bores of the new FZR are plated with a ceramic composite. Heat transfer is improved, so tighter tolerances can be used, so efficiency goes up. Simple. There's a larger radiator too. Wear rates are also apparently reduced. The early morning upshot of this material science breakthrough is that from cold, the FZR starts with not a puff of dirty exhaust smoke in sight. More reliability improvements: crankcases are stiffer and the clutch is beefier and bigger. THE NEW DELTABOX frame is a steel replica of the YZF's alloy affair. It's twice as stiff as the old frame and sounds a lot more solid when you tap it. Alloy wasn't allowed because it costs too much. The engine acts as a stressed member, hanging from the cylinder head and the rear of the crank cases. By hanging the engine at a steeper angle (35 degrees instead of 45), Yamaha has managed to cut the wheelbase by 10mm. The centre of gravity has presumably risen accordingly, but Yamaha doesn't mention this. To counter the friskiness of a shorter wheelbase, trail goes up by 3mm, but rake stays at 25 degrees. At the front are new 41mm forks, at the rear is a new Deltabox swing-arm. Both hold new wider wheels - 120/60-17 front and 160/60-17 rear. Brakes: discs and calipers stay the same; levers, lines and master cylinders get fiddled with.